Pioneers in the industry, we offer milk coolers from India. We have gained an immense technological knowledge and vast industry experience of manufacturing a premium range of Water and Milk Chillers such as Milk Coolers that can be customized based on specifications provided by our valued clients. We observe rigid standards of quality by complying with preset industry norms at every stage of manufacturing. These are made by using the finest grades of stainless steel alloys for assured durability and high standards of hygiene. 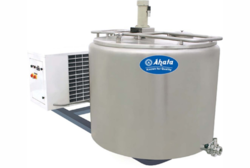 These are highly acclaimed because of excellent chilling efficiency that is ensured by supreme chilling unit and Thermal Plate Technology that seamlessly maintains temperature of the milk at desired level even at low volumes of milk. Looking for Milk Coolers ?